I love to mind map It is such an easy way to organize your ideas, but I use it for much more. If I take notes in a meeting, a conversation, a discussion, a presentation, a conference session, I will do that in the form of a mind map. Tony Buzan claims to have invented them. But I’m afraid that his program iMindMap is not the best software around, that title goes to MindNode. I know it because in the past period I have tried lots of them. 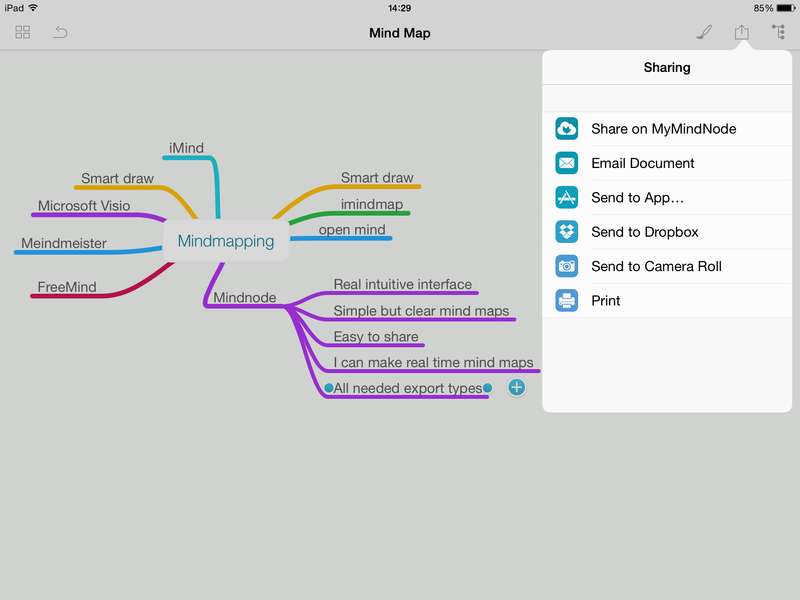 I used to use MindNode on my Ipad (1) and was very happy with both my Ipad and MindNode. But IOS6 came out (september 2012) and I wasn’t able to upgrade to it with my Ipad. I really hate that. One day when yet an other app would not run anymore I had had it, and I switched to Android. But MindNode is only available on Iphone, Ipad and Macs, so I started trying out all the alternatives (Paid and free). None of them came close to MindNode. It has a very intuitive interface. Everything works the way you think it should work. Sharing is easy. I can mail them, save them in Dropbox, save them as an image or as a mind-map (mm) file, that I can use in other programs. Perfect. It is the only Mindmapping app I know that works so simple that I can use it on my tablet to make real-time mind maps. I mean capturing a presentation or conversation on the go. Change the title. The central text will be automatically the title of the mind map, which is fine. But when you change that text, the title doesn’t change with it. It has a smart Lay-out feature, that works fine, except it doesn’t use the bottom and top of the mind map. All nodes are placed on the left or right. I don’t like that. These are the only two things I can come up with. The cool thing is that MindNode is build by a 1 person company, Markus Müller-Simhofer is the company. I read that he recently hired his first employee. On his website he says his goal is ‘designing intuitive and consumer friendly software’. Well he did. As a software vendor and product owner I know how difficult it is to built really good software, so my compliments to Markus. Anyway, if you want to mind map on a Apple device, there is in my mind no other option than MindNode.